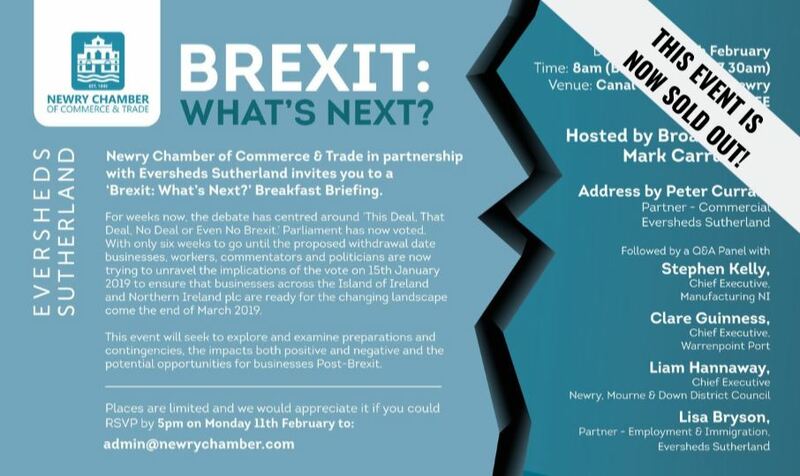 Newry Chamber of Commerce & Trade in partnership with Eversheds Sutherland invites you to a ‘Brexit: What’s Next?’ Breakfast Briefing. For weeks now, the debate has centred around ‘This Deal, That Deal, No Deal or Even No Brexit.’ Parliament has now voted. With only six weeks to go until the proposed withdrawal date businesses, workers, commentators and politicians are now trying to unravel the implications of the vote on 15th January 2019 to ensure that businesses across the Island of Ireland and Northern Ireland are ready for the changing landscape come the end of March 2019. Hosted by Broadcaster, Mark Carruthers the event will seek to explore and examine preparations and contingencies, the impacts both positive and negative and the potential opportunities for business Post-Brexit.